I have a new computer coming, to replace my fairly choked up ten year old, with windows 7. It means moving on to 10. Laura did it; I can do it. It's like, all those little kids in France speak French, and so will I. Some office furniture has been switched out, including the oak filing cabinet from our weaving studio days. 1989 or 1990. I did not realize the one I bought needed assembly. Laura and I have opposite assembly protocol. Mine is to clear the area of packing material, lay out parts in order by parts list, read instructions. Hers is to throw packing material over her shoulder as needed, and start. She is up to listening to me read directions, staring glassy eyed into the distance, and beginning as soon as I am quiet. The fact I've laid it all out in order before I let her dive in is essential. The fact she is left brained and I am neither, these days, generally gets her home nearly free. It's March, and here in Ohio some organization is serving pancakes and trimmings every Sunday. We live in the land of sugar maples and dairy cows, and can find pancakes with real maple syrup and real butter if we go to Geauga County. And so we did. The twin cousins. Two weeks apart in birth, one foot apart in height. I haven't seen Francis since last summer. On my side of the table, Ruth, Beth and me. We all looked grumpy in our picture. We need smile lessons from the kids. This post made me smile. And now I want pancakes. I just ordered a new table to have beside my chair. For the first time my son OFFERED to assemble it for me. I think is tired of my frustration and arm waving as I try to make things go together. Yup...pancake time here as well. It's a tad early this year. Who doesn't smile with maple syrup in their mouths. Jenny and I do our best to avoid self-assembly items as they invariably need an IQ of about 200 to fathom out which part goes where and how you fit them all together. I haven't had pancakes for years. It's about time I revisited them. But I'm too lazy to make them, I shall just plunder the local bakery. It is good to see your grandson again. Is there anything Laura won’t tackle? She is such a capable young woman! You have wonderful, beautiful grandchildren, Joanne. You will get used to the 10. I've had it for a couple of years and it's second nature now. Granted, I did have my techies telling me what to do. my over ten year old hp laptop has automatically updated me on up to windows 10 with no problem, the computer store said it should last another 5 years; I hope so; I know dh complained about how much it cost us when we sold our home in CA but it seemed worth it at the time; now I think it was a good choice. dh and laura are of the same vein on putting together items; I am with you read first and then organize. You are a wonder Joanne. Show me a schematic/instruction booklet and I die in a puddle on the floor. 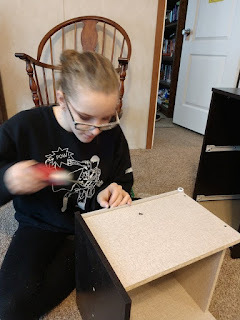 Laura has the same attitude to assembly as most men - put the thing together first and read the instructions afterwards. I need instructions like a fish needs water -- zero spatial ability. My husband is the opposite. So if he is putting something together I go to the furthest away place I can - the mall, say - while he does it because I am too tempted to wade in and "organize" his thinking! Those pancakes with all the trimmings do sound good. I read (and reread) instructions. Himself just starts. Between us it (mostly) works out. Love those smiles. Not big on maple syrup though. Laura sounds like my K, who also tosses aside instructions and dives right in. When questioned about leftover screws, she says they always give you extra in case you lose a couple. I miss pancakes, with real butter and real syrup. They're on my no-no list for now. I hate putting things together and my AAD kicks in mightily when I am given a too long set of instructions with micro small printing. It is good you have a helper. I am adept, though, at throwing away the cardboard in the recycling bin. 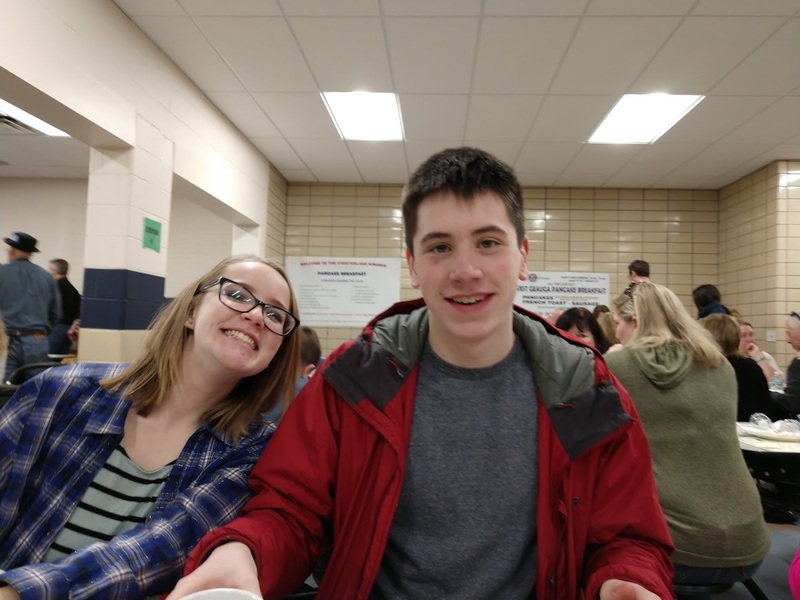 Ah, wonderful, wonderful pancakes and beautiful smiles from your grandchildren across the table. There couldn’t be a better way to start a day. That was funny: that you are neither brained. 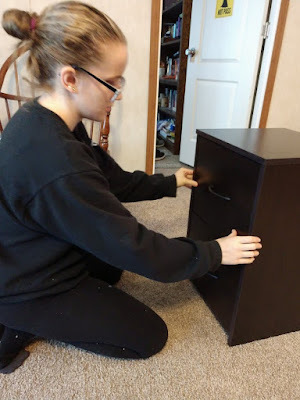 I'm probably more like Laura when it comes to assembling things but why you would want to replace a nice oak filing cabinet with a particle board one is beyond me. and now I want pancakes too. Mr. Oak was so heavy it needed two granddaughters to move it and so large it would not fit where I really wanted it. So I gave it to the maintenance man and I'm sure it's in their office, and has pop stains all over the top by now. Works for me. I need to have this all sorted before I'm down to no resident children! Dear Joanne, like you, I need to separate the labeled parts and then step-by-step read the instructions. It's a slow, tedious process but the only way I can handle the stimuli of all those pieces. I'm so glad you have Laura to help you--or simply to do it as my niece is doing the work of getting me published! Enjoy those pancakes and that real maple syrup! Peace. I hear you about the resident child! Sure could use one around here--especially since spring has arrived with all its attendant yard chores. Good to see France with the smile, I wonder if he is still biking and blogging. Joanne, when we bought a new laptop not that long ago to compensate for our old desktop, we went from 'Vista' to Windows 10. It took a bit of time to get used to... but we did it. As for assembling things, I don't generally try... just hand it over to DH who has the logical brain. I can create things, but not necessarily put things together that need to go a certain way. Not only do little kids in France speak French. All their road signs are in French. I was there and got lost. I do enjoy good pancakes. Even more impressive: small children speaking French while barreling down moguls in the alps. May the new computer treat you well. Hubby is the one who assembles furniture here in my home. But I sometimes help by holding two pieces together while he hammers a nail. Well there is no doubt that these two are smiling. I can't even think of beginning a project like that until I've sorted everything out!